The writer of the article in our contemporary, we think wrongly, brings forward two remarkable instances of what may be regarded as practical jokes with melancholy terminations. 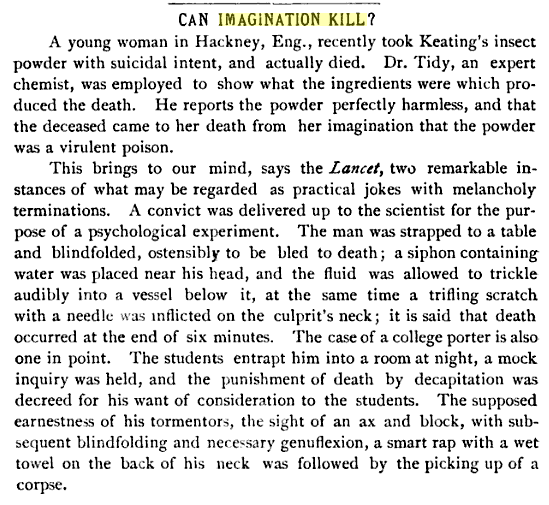 In the case of the convict delivered up to the scientist for the purpose of a psychological experiment (the man was strapped to a table and blindfolded, ostensibly to he bled to death; a syphon containing water was placed near his head, and the fluid was allowed to trickle audibly into a vessel below it, at the same time that a trifling , scratch with a needle was inflicted on the culprit'a neck ; it is said that death occurred at the end of six minutes), fear must have played no inconsiderable share in the fatal result, and we do not knew whether all the vital organs were in sound condition, though they were presumably so. The Lancet rapproche de ce cas tout récent deux exemples de cruelle mystification, ou la mort survint également sous le coup d'une profonde terreur. An idea, an impression, a mental commotion, while entirely internal, can produce in another direction physiological effects more or less intense, and is even capable of causing death. Examples are not wanting of persons dying suddenly in consequence of emotion. The power which imagination is capable of exercising over life itself has long been established. 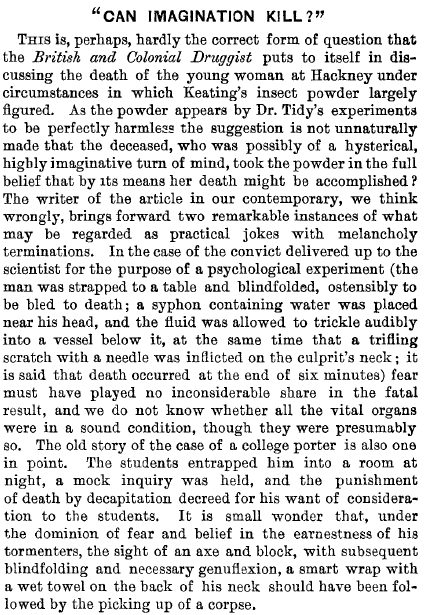 The experiment performed in the last century in England on a man condemned to death, who was made the subject of a study of this kind by medical men, is well known. The subject of the experiment was fastened securely to a table with strong straps, his eyes were bandaged, and he was then told that he was to be bled from the neck until every drop of his blood had been drained. 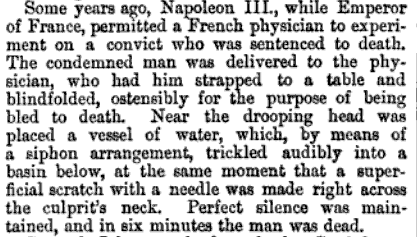 After this an insignificant puncture was made in his skin with the point of a needle, and a siphon arranged near his head in such a manner as to allow a continuous stream of water to flow over his neck and fall with a slight sound into a basin placed on the floor. At the end of six minutes the condemned man, believing that he had lost at least seven or eight quarts of blood, died of terror. Une idée, tout intérieure, une impression, une commotion mentale peut, à l’inverse, produire des effets physiologiques plus ou moins intenses, et même amener la mort. Il ne manque pas d’exemples de personnes mortes subitement à la suite d’une émotion. La preuve est donnée depuis longtemps des effets de la puissance de l’imagination sur la vie elle-même. Personne n’a oublié l’expérience faite à Copenhague en 1750 sur un condamné, livré à des médecins pour une étude de ce genre, et qui fut observé jusqu’à la mort inclusivement. Ce malheureux avait été solidement attaché à une table avec de fortes courroies ; on lui avait bandé les yeux ; puis on lui avait annoncé qu’il allait être saigné au cou et qu’on laisserait couler son sang jusqu’à l’épuisement complet ; après quoi une piqûre insignifiante fut pratiquée à son épiderme avec la pointe d’une aiguille, et un siphon déposé près de sa tête, de manière à faire couler sur son cou un filet d’eau qui tombait sans interruption avec un bruit léger, dans un bassin placé à terre. Le supplicié convaincu qu’il avait dû perdre 7 à 8 litres de sang, mourut de peur. What people think decides what they are. Prosperity is to a considerable extent a matter of psychology. Once a man was fastened in a chair, his feet put in warm water, and as a practical joke he was shown a razor of which the blunt end was drawn across the soles of his bare feet. 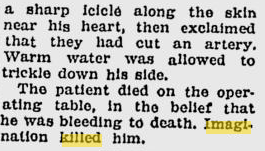 He was told, "You will bleed to death painlessly in this warm water." He didn't lose a drop of blood, but he died. Don't let prosperity die in that fashion, killed by imagination. Emotions as the Cause of Rapid and Sudden Death. Dr. N. S. Yawger. My interest in the psychological was constantly rearoused by clinical observation and by studying the encyclopedic literature. A report in an Indian medical periodical, "Killed by the Imagination"* left and indelible impression early in my carrier. A Hindu physician was authorized by prison authorities to conduct an astonishing experiment on a criminal condemned to death by hanging. The doctor pesuaded the prisoner to permit himself to be exsanguinated -- bled to death -- assuring him that death, though gradual, would be painless. 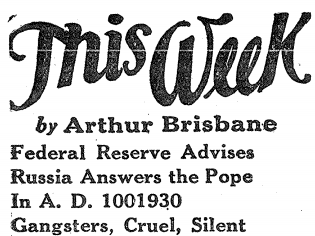 The convict, on agreeing, was strapped to a bed and blindfolded. Vessels filled with water were hung at each of the four bedposts and set up to drip into basins on the floor. The skin on his four exremities was scratched, and the water began to drip into the containers, initially fast, then progressively slowing. By degrees the prisoner grew weaker, a condition reinforced by the physician's intoning a lower and lower voice. Finally the silence was absolute as the dripping of water ceased. Although the prisoner was healthy young man, at the completion of the experiment, when the water flow stopped, he appeared to have fainted. 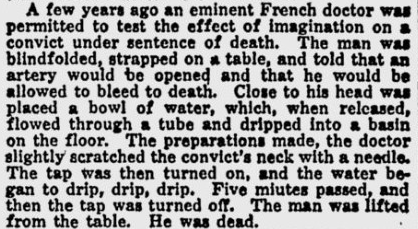 On examination, however, he was found to be dead despite not having lost not a drop of blood. Over the centuries, a wealth of similar anecdotes has been amassed. The medical profession has long known that nervous activity influences every part of the body. Nearly 350 years ago, William Harvey, discoverer of the circulation of the blood, stated: "Every affection of the mind that is attended with either pain or pleasure, hope or fear is the cause of an agitation whose influence extends to the heart." *N.S. Yagwer, "Emotions as a Cause of Rapid and Sudden Death", Archives of Neurology and Psychiatry, 36 (1936), 875. 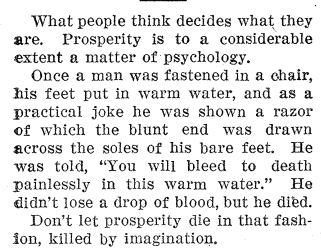 In 1936, in India, recounts Nobel Laureate Bernard Lown in "The Lost Art of Healing," an astonishing experiment was conducted on a prisoner condemned to die by hanging. He was given the choice instead of being "exsanguinated," or having his blood let out, because this would be gradual and relatively painless. The victim agreed, was strapped to the bed and blindfolded. Unbeknownst to him, water containers were attached to the four bedposts and drip buckets set up below. Then after light scratches were made on his four extremities, the fake drip brigade began: First rapidly, then slowly, always loudly. "As the dripping of water stopped, the healthy young man's heart stopped also. He was dead, having lost not a drop of blood." Another dramatic example of the power of expectancy involves an inmate who was in prison and sentenced to be executed, He was offered a chance to participate in a research project and told that if he lived through it his sentence would be reduce to life in prison. The prisoner consented and the experiment was conducted. They wanted to find out how much blood a person could lose and still live. The researchers placed the prisoner in a darkened operating room and made a very slight incision. Very little blood was lost through the incision. But they arranged for sound effects to simulate the dropping of blood which the prisoner believed was his own blood. The next morning, the researchers came into the operating room and found the prisoner had died, He died of his belief that he was bleeding to death. By the way, this study was conducted in the early 20th century and certainly wouldn't be sanctioned under our new AMA guidelines. People are romantics. They desire the unknown and the unknowable. They seek mysteries. The incompleteness theorems say something like "there's something that's true but we can't know it." The theorems justify their desire for mystery, and they latch on to them. Nonetheless, the incompleteness theorems don't apply outside of formal mathematics.